The New York area tennis community is one that is comprised of people from all walks of life … many of whom make paying it forward a point of emphasis. 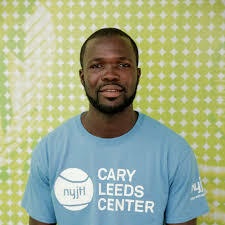 That is embodied in Michael Nortey, a High Performance Instructor at The Cary Leeds Center for Tennis & Learning in the Bronx, N.Y.
A native of the African nation of GC, Nortey was a top junior player growing up in Osu, a suburb of Accra, being raised in a family that loved sports. A two-sport athlete, Nortey eventually decided to turn his focus to tennis. His game quickly took off, and he was soon competing for Ghana’s national team at a number of different international tournaments, including the Davis Cup. Nortey came to the United States in 2008 in the hopes of advancing his tennis career, working at a few different places before finding a home at Cary Leeds, where he currently works as a High Performance Coach who, as he says, “loves his job.” He works at developing the skills and techniques of high-performance Green Dot players, and he has an infectious passion for the game that is evident when watching him on-court with young players. As he pursued a career in coaching here in New York, he always remained in contact with his family back home in Ghana, and wanted to help grow the game of tennis there. And that is just what he began doing. For several years now, Nortey has gathered tennis equipment and sent it back to Ghana in the hopes of developing the game amongst kids there. With his help, some of the tennis players in Ghana have gone on to compete in the ITF/CAT African Juvenile Championships, ITF 12U, 14U, 16U and 18U tournaments, and some have even won various national junior tournaments. Nortey continues to use his platform and the resources he has to benefit the new generation of players and kids growing up in his native country. He knows first-hand just how important and influential the sport of tennis can be on young children, and how oftentimes it can be difficult for those who are underprivileged to play.